Jumptown presents: Collegiate Shag Workshop with Squish and Alex! Join us for 3 hours for collegiate shag fun, taught by two of Sydney’s favourite shag teachers, Squish and Alex. Facebook event here! This 3 hour workshop is aimed at getting you out collegiate shagging on the social dance floor in one afternoon! *Class 1: Introduction – No previous experience required. You’ll learn the basic 6 count rhythm in closed, open and side-by-side. *Class 2: Fundamentals – Building on the previous hour, we introduce turns, transitions and the 8 count rhythm and variations. *Class 3: Rhythms and variations – You’ve nailed the basic and can transition between closed/open/side-by-side. Time for a few more moves, dancing in phrases and a mini-routine to wrap it all up. Whether you’re completely new to shag or already have some steps under your belt, Alex and Squish will ensure you have a blast and come away some new ideas and moves in your pockets. Squish began lindy hopping in Sydney in 2005. After joining SwingTime Dance in 2007, she had her first brush with shag during a performance troupe routine and was instantly a fan. After that she sought out opportunities to dance shag wherever she could, both in Australia and internationally. Squish is an experienced dance teacher, having taught various forms of swing since 2010, and she has also competed and placed in numerous national competitions. Alex started learning the lindy hop in Sydney in 2014. After moving to London in 2015, he had his first encounter with collegiate shag and was immediately hooked. During his time in Europe he performed and taught shag (both collegiate and St Louis) in London and Berlin, and competed and placed in several competitions. After moving back to Sydney at the end of 2017, Alex teamed up with Squish and they’ve been sharing the joy of shag with Sydney ever since. Each individual class $25 online or at the door. Cash and card accepted at the door. 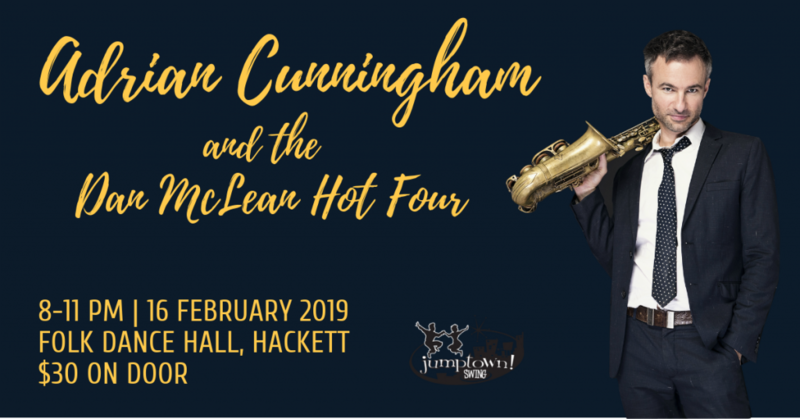 Jumptown Swing presents Adrian Cunningham and the Dan McLean Hot Four! Internationally renowned band leader Adrian Cunningham is returning to the capital on Saturday 16 February 2019 for one night only of swingin’ jazz perfect for dancers. Facebook event here! Teaming up with some of our finest local musicians, featuring Dan McLean (trumpet), Damien Slingsby (piano), James Luke (bass) and Steve Richards (drums), this 5-piece outfit promises classic tunes, wailing solos and an authentic, infectious energy that will keep the joint jumping all night long. Sydney born and bred, Adrian Cunningham is an acclaimed jazz musician now based in New York City. When not playing gigs in the Big Apple with his band Professor Cunningham and His Old School, he can be found thrilling dancers all around the globe at high profile events, including The Snowball (Sweden) and Australia’s very own Melbourne International Jazz Festival. Whether he’s on saxophone, clarinet or vocals, Adrian definitely knows how to swing it and keep the dance floor full. As one of the most sought-after band leaders on the international scene, he knows what dancers want and never fails to deliver. Expect pure, uncut, old school jazz guaranteed to get your feet tappin’ and your soul swingin’. We dare you to try and sit still once this dynamic band starts up. $30 on the door, cash or card accepted.